Hello there and thank you for stopping by today. Today is the third day of the MFT December Release Countdown. Only 3 days until the new release (yay)! Be sure to head over to the MFT Blog for full set and die reveals for the day. This release is packed full of gorgeous new products that I have SO enjoyed creating with. My first card today features the new Doodle Blossoms stamp set and Die-namics. 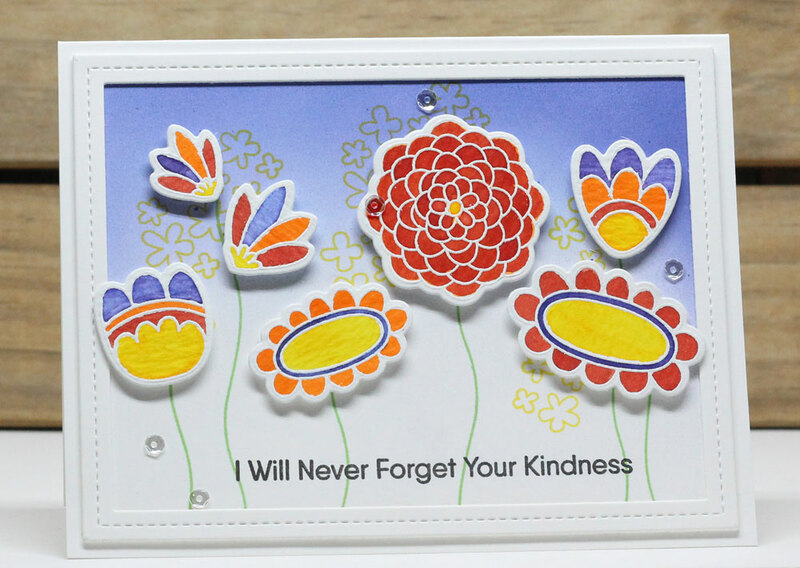 The whimsical style is perfect to pair with just about any sentiment or word die set. I chose to use the soon-to-be-released Kind Words stamp set. The scene was framed with a Single Stitch Line Rectangle Frame and I used some bright blue to airbrush the upper half of of the background. I accented the panel with a few Sparkle Sequins. These products and many more will be available for purchase in just 3 days, on December 6 at 10 PM EST. Be sure to check out the MFT Blog to see what the rest of the team has come up with today. What a fun card! This is going to be first on my list! A beautiful card, the stamp set can be used for different themes. Thanks for the inspiration. The doodle flowers are so much fun- great job coloring them! Great colours! Makes for a beautiful card!